Blog Why do athletes achieve their goals? The world of sport and athletics has always fascinated me. The courage and conviction of athletes in their field to be the very best is phenomenal. I have been studying and exploring lots of different coaching methods recently and I have examined some of the best athletes in the world to understand the importance of the coach to their success. Here are some of the key learns I gleaned from my research that will help you be more successful in your daily lives. Every successful athlete has one thing in common, they have a daily routine which they stick to and that challenges them. Like all successful day, doing simple things routinely helps embed the habits which pave the way to success. Or P.M.A as a lot of people like to refer to it is crucial to an athlete’s chance of success. Visualisation of success is a huge part of how the top athletes in the world have gone from good to great. Being able to set clear, tangible goals and visualise what success looks like goes a long way to setting up athletes for success. You too can create a visual picture of what success looks like for you and remind yourself of this regularly to help you on the road to success. In sport, more than any other profession the true value of the coach is highlighted. The coach is often what is the difference between winning and coming second. Challenging, questioning and motivating the athlete are all fundamental credentials of a great coach. I would argue without someone who truly challenges you and holds you accountable it is impossible to be the best irrespective of your career path – being coached is crucial. What fascinates me most about athletes is the time they apportion to pre and post performance analysis. Split times, time out of the blocks, wind speed. It is all crucial to understanding how you can improve as an athlete. Knowing your competitors strengths and weaknesses as well as your own can propel you to phenomenal heights in sports. Why then do we not adopt this in our day to day life? 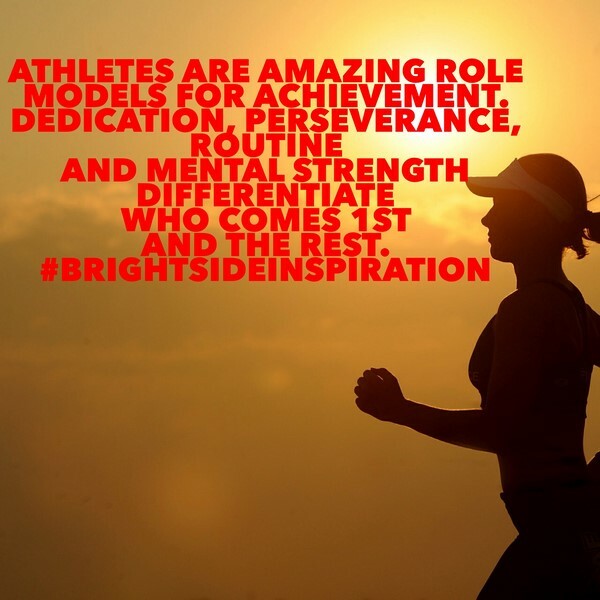 If we truly want to be the best we need to learn from those at the top of their game – athletes are a shining example to us all. Taking heed and learning from these 4 key habits of successful athletes will help you to be successful in your personal life and careers. I would love to hear what helps you to achieve your goals! A nice and informative article Karran and i cannot agree with you more! Its absolutely essential to build routines for good habit creation and indeed with the reading and self-education I do I have learned that all successful people in this small world all stick to routine, exercise everyday and get up early in the morning to get the exercise done, like myself, I get up at 04:30 for the gym, which is hard but well worth it. Its much better and easier to be positive than negative, being positive brings in positive changes and experiences, being negative is the same, you are a reflection of yourself so always reflect positiveness, you’ll see that you’ll not only get more done but you’ll realise success will come sooner. Thanks for taking the time to comment and for your insightful response. Sounds like you have a great sense of your strengths and areas to develop on. If you ever want to chat more about anything discussed in the article and how to make it happen in your personal and work life I would be delighted to.